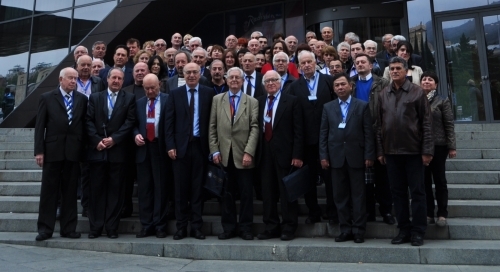 International Conference "Advanced Materials and Technologie"
International Conference on: “Advanced Materials and Technologies” (ICAMT) held by Ilia Vekua Sukhumi Institute of Physics and Technology in Tbilisi was dedicated to its 70th anniversary, October 21-23, 2015. •Research and monitoring of the territories contaminated by radionuclides and hazardous toxic substances. Academician Temur Naneishvili, vice-president of the Academy, made a welcoming speech at the Georgian National Academy of Sciences Assembly Hall. Guram Bokuchava, Director of the Institute, gave a talk on the establishment and development stages of the Institute including its main achievements. Speeches at the Conference Opening were made by: Ucha Dzodzuashvili, General Director of LEPL State Military Scientific-Technical Centre DELTA, his Excellency Mr.George Nazarov, Ukrainian Ambassador to Georgia, Elguja Gvazava, Chairman of the Supreme Council of Autonomous Republic of Abkhazi, Patrick Grey, Leader of CNCP Program (Close Nuclear Partnership Centers of Great Britain), George Esadze, General Director of National High Technology Center of Georgia, Lukian Anatichuk, Academician of the National Academy of Sciences of Ukraine, Director of The Institute of Thermoelectricity, President of the International Thermoelectric Academy, awarded an International Thermoelectric Academy Diploma to SIPT. Since 1950s, SIPT has collaborated with National Science Center „Kharkov Institute of Physics and Technology“ (KIPT). A delegation from KIPT: Volodymir Chyzhov, Borys Shyrokov, Volodymyr Levenets. Professor Fernando Marquis, San Diego State University and Dr. Ken Walsh, Dean of San Diego State University Georgia, Nodar Tsintsadze, Academician of the Georgian National Academy of Sciences and John Apakidze, Rector of Sokhumi State University, Ilkham Sadikov, Representative of the Institute of Nuclear Physics, Academician George Tavadze, F.Tavadze Institute of Metallurgy and Materials Science, Amiran Bibilashvili, Director of the Institute of Micro- and Nanoelectronics and Nikoloz Chikhradze, Director of G. Tsulukidze Mining Institute. Special attention was drawn to Professor Klaus Thiessen (the son of Peter Thiessen, who worked in SIPT), the immediate participant of the Sukhumi Institute’s establishment, who sheared with most interesting memories about Sinop Institute. Historical aspects, state of the art and trends of further development of thermoelectricity. Anzor Guldamashvili - Major stages of Ion implantation development in Ilia Vekua Sukhumi Institute of Physics and Technology. The Conference continued its activities in Radisson Blu Iveria hotel on October 22 and 23. In total, 72 presentations were submitted at the Conference. The conference was attended by scientists and researchers from 44 Wolrd Scientific Centers. At the Closing part of the Conference held on October 23 in Radisson Blu Iveria hotel, many of foreign and Georgian scientists gave talks and highly assessed the Conference, considering both scientific and organizational issues. The Conference materials were published in proceedings.